I got a request from my cousin to make a Captain America amigurumi, and since I couldn’t find any good free patterns online, I decided to come up with my own! This is my first amigurumi design, and I had a lot of fun thinking of how to create this little guy! I hope you have fun making him too! A tiny Captain America! He has trouble standing up on his own because he ate too much and became a little tubby! All parts are done with a 2.75mm hook unless otherwise stated. Start tying ends in the wrong side. Insert 11mm safety eyes in row before the colour change to beige. Tie any other remaining ends. At the end of round 6, jogless colour change to ocean yarn in next st.
Fasten off, leaving a long tail for sewing. Tie in ends and stuff. Fasten off, leaving a long end for sewing. Row 2: Turn, starting from 2nd st from hook, sc in next 3 st, ch3. Row 3: Turn, starting from 2nd st from hook, sc in next 5 st, ch1. Row 4: Turn, starting from 2nd st from hook, sc in next 5 st, ch3. Row 5: Turn, starting from 2nd st from hook, sc in next 7 st. Along the side, sc2tog such that your hook is now back at the starting position. Fasten off. Tie ends together. Fasten off with a LONG end. Round 2: *sl st to next st, ch 3, turn, from 2nd hook from st, sc in next 2 st* around. You should end up with 5 points. Sew star to front of shield. Backstitch to front of shield along the white ring. Ensure that all knots are hidden in the space within the two parts of the shield. Sew completed shield to left arm. I hope you enjoyed making this little guy! If you enjoyed this creation, please do share it around with your craft-loving friends too! Aren’t these guys just adorable? 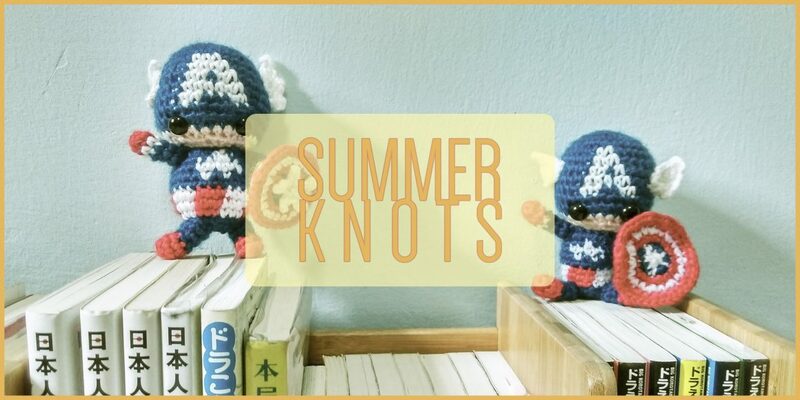 This is an original Summer Knots pattern. As such, please kindly do not claim it as your own. You may place a link to this pattern from your site, but please do not repost it onto your page. Do share your own creations with me too!